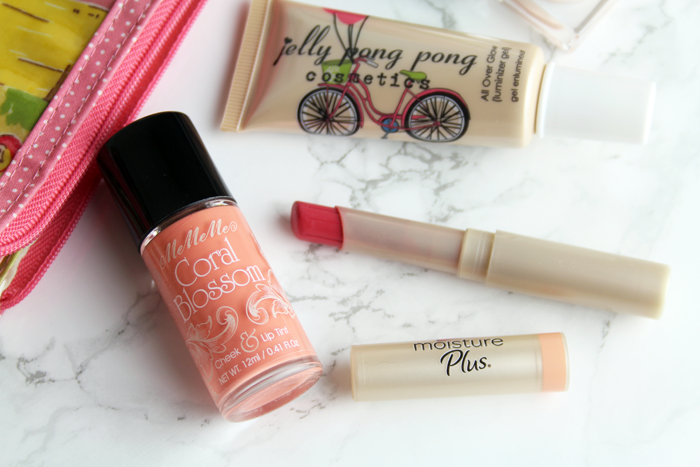 Summer is on its way and to celebrate I decided it's well and truly time to break out the peach hues and warm highlighters. My final assignment is due tomorrow and after that I'm free to, you know, actually leave the house again and go on some adventures. Oh how I'm looking forward to doing my make up again and putting on some clothes that aren't sweat pants and over sized jumpers. Hooray! What's in your make up bag this month? P.S. Check out my first "All Aboard" advertiser Sunny Sweet Pea! That cheek and lip tint looks like such a nice color! Gosh, I haven't seen a Jelly Pong Pong product in years! Is that that cashmere highlighter stuff that Glossybox sent out last year? I still have it too! :D It seems to last forever, I've barely dented it. I received the Jelly Pong Pong highlighter in my Glossybox a few months back. It works so well and a little goes a very long way! Wow, Benefit makes the prettiest products!